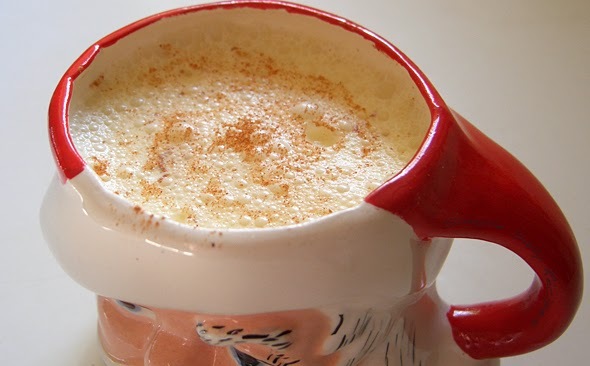 For me it’s not really Thanksgiving Day until I take that first sip of eggnog. On Turkey Day I’ll down at least one tall glass of this yellowish thick concoction, maybe more. I’ll use it to sweeten my coffee too. That’s one of my rituals. One thing I’ve done every single Thanksgiving Day since I can remember. I’ve no idea exactly when this personal ritual began. After fifty three Thanksgiving Days, all that eggnog and turkey and mashed potatoes and pie blurs together in memory. But a Thanksgiving without eggnog, this belly busting, artery clogging drink that weighs in at 225 calories per eight ounce serving? Perish the thought. I need Thanksgiving. Even more, I need the rituals of that day. Traditions. Familiar comfort foods. Family I’ve missed and am so happy to see again. The Macy’s Parade on TV in the morning, then watching football, after the table is cleared and we all go comatose on the couch. The ritual of old friends who come and stay for a couple of days. Grace before we eat, when each of us names one thing we are truly grateful to our God for. Ritual. I can’t imagine life without cherished rituals: at the Thanksgiving table, in faith, in all things. Can you? Merriam-Webster’s Dictionary defines ritual as, “a sequence of activities involving gestures, words, and objects, performed…according to set sequence.” Translation: a ritual is something that we do again and again and again, which somehow anchors us in this ever changing life. Grounds us. An action repeated. Familiar prayers prayed. A meal shared. Ancient rites revisited. In ritual, we return to the familiar, feel at home, safe. Like we’ve arrived back at a place that we must revisit: to remind us who we are, what matters, what lasts. Self-made rituals too. I always give the book “Curious George” to new babies in my extended circle of family and friends. Always pop a deviled egg in my mouth first thing at a church reception. Always drink diet Dr. Pepper and munch cheddar cheese Combos at the airport. Always read the New York Times newspaper every Sunday afternoon. Rituals can be easy to take for granted. Reject as old school, old fashioned, stuffy. There is always a danger in practicing unexamined ritual: mumbling through dusty prayers at church or carrying on some family ritual which no longer fits. The best rituals are always examined and renewed, passed down from generation to generation, owned by those in the present day. Don’t like a ritual? Bored with it? Start a new one. Invent a new tradition with your clan. Rituals are “do it yourself”. Or step back into a ritual you’ve lost or need to find again. Go back to your faith. Remember again a childhood prayer and then teach it to your kid. Only you can figure out what rituals work best, carry the most meaning. But the point is clear: to be human is to live by ritual, in ritual, and through ritual. No ritual? No life. Not really. So what Thanksgiving Day rituals are you most anticipating? An old family recipe passed down from Mom to son, grandfather to granddaughter. Touch football on the lawn. Delivering a bag full of groceries to the local food pantry. Inviting someone to the table who may have no where else to go. Jumping for joy when your child returns home from being away. The yearly board game after the meal. Trekking out to the mall in the dawn’s early light to find a bargain. All good. All precious rituals for the living of this day. 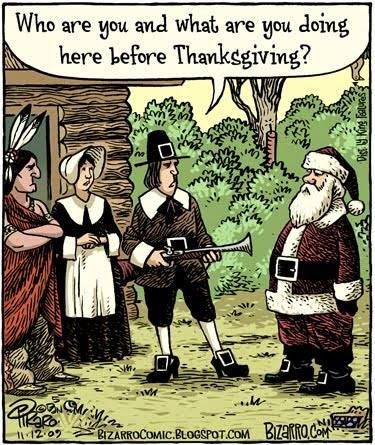 So Happy Thanksgiving, and can you please pass the eggnog?! Just Say "No" to Christmas in November: PLEASE! Here’s a thought. How about we all just say “No” to the Christmas rush now cranking up to full speed? Have you noticed? Barely halfway through November and the push has begun: for holiday shopping, holiday music, holiday sales, and holiday hype. Yuck. No. Not yet. Please?! It’s just too soon. It’s way too early. It feels forced, rushed, fake. NO! I don’t know about you but I just can’t face the looming visage of Santa Claus while there are still leaves on the trees. I can’t think about holiday shopping a full week before Thanksgiving. Wasn’t it just Halloween? I can’t stand hearing “White Christmas” on the radio for the next 35 days. I still miss summer! I haven’t put away the patio furniture yet. I can’t watch the barrage of cheery holiday themed commercials already running wall to wall on TV and the Internet, in the newspaper too. I know this is probably a losing battle. “Christmas creep” is the norm now in our culture. That’s where 12/25 keeps sliding further back and back on the calendar. The shadow this secular holiday casts over all of December, even much of November, gets longer and longer every year. I don’t mean to sound like a Christmas crank. I love Christmas: in its right time, at the right time. I love all the kitsch and the music and lights and traditions. Heck I “do” Christmas for a living. I work to make this holiday a holy day too, for those in my faith tradition. I just want Christmas to be…well, Christmas, and nothing more. Christmas: limited to days, not months. Christmas: about family and time off and faith. Christmas: with clear boundaries around it: a time of the year with a sane beginning, middle and end. Some folks seem to be pushing back. In response to retailers like Wal Mart, Target, Macy’s and Michael’s, opening their doors on Thanksgiving Day as early as 4 pm, other stores proudly declare that they will be closed, until midnight. Nice of them to let their underpaid workers stay with loved ones until 11:45 pm, Thanksgiving Eve. Then the hordes will descend and the fights over big screen TVs and video games can begin. Long ago my New England Puritan forebears actually outlawed Christmas as a holiday and a holy day here in Massachusetts. Up until 1870, when Christmas became a federal holiday, most folks in the Bay State worked on the 25th. It was just another day. Puritans and other faith purists saw Christmas as a pagan holiday, more about debauchery and drinking, than anything sacred. Not that I want to return to this extreme prohibition. All I’d like to see is more sanity in how we as a culture and individuals mark what is supposed to be just one very special day at the close of the year. One day. A few weeks beforehand where anticipation and excitement lift up our spirits and soothe our weary winter souls at the darkest time of the year. A special season, made that much more sacred by its limited nature. A very short time when regardless of whether or not we practice faith, humans hope to be more generous, giving, kind and loving, especially to those who are hurting or poor or lonely. Christmas is Christmas because it has boundaries, from midnight on the 24th to 12:01 am on the 26th. No sooner. No later. Right? The best kind of life is one in which us humans know how to set and honor such clear boundaries. Know when to say “yes” and know when to say “no”. Remember when it is time to celebrate and when it's time to just wait for the celebration. Not easy. We live in a world now largely without boundaries. We can work 24/7. Shop 24/7. Go to McDonalds at 2 am and eat dinner, watch a movie on Netflix whenever we want. Text a friend or answer a text before we even get out of bed. There is no culturally agreed upon idea of Sabbath, or stopping, or resting. No boundaries. None anymore. Unless we set them. For ourselves. Our families. Life. So I will get to Christmas, when I get to Christmas, and not a day earlier. I’m still looking forward to Thanksgiving. Remember that holiday? So pass the turkey please, and put on the football game. Make space on the couch for a long nap. Then, and only then, after that wonderful holiday, just maybe I’ll be ready to meet December. Not a day sooner. You can’t live in our world these days without being aware of the social phenomenon of “the selfie”, a digital image in which the one who snaps the photo is always the center of attention. The focus. The number one subject. There may be other elements in the picture, other people or landmarks, but pretty much most of the time a selfie is, by its nature, all about “me”. “Me” at the Grand Canyon. “Me” at a Patriots football game. “Me” at a wedding on the Cape. Me. The selfie formula is then completed by uploading that self portrait to cyberspace where other “me’s” can see their fellow “me’s” too. Me looking at me on Facebook, Twitter, Instagram, Snapchat, etc. I tried a few times to take a selfie. Epic fails. I couldn’t figure out how to get my phone to make the shot. It felt kind of weird to indulge in such self focused portraiture. And when I did finally snap a picture, it was at such an odd angle, that it came out as a warped view up my nose. Probably wouldn’t garner many “likes” on Facebook so I deleted that photo. I’m a selfie sad sack. The taking of selfies has even become risky business, as some scramble to get the absolute best and most dramatic photos. At last summer’s Tour De France bicycle race, several riders were thrown off their bikes and injured when enthusiastic selfie takers stepped right out onto the course. “CHEESE!” and then a selfie snapper got run over by a cyclist zooming at 25 miles per hour. 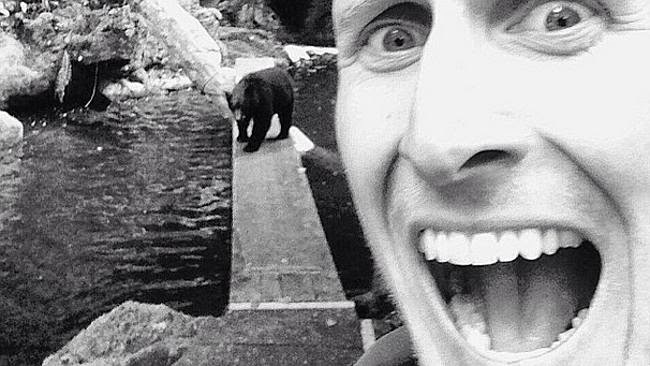 Or there’s the selfie folks at Lake Tahoe in California who take “bear selfies”, posing right in front of live grizzlies. I’m not making this up. Park Rangers are, of course, trying to ban this dangerous practice but I’m waiting for the selfie photo of the split second just before a bear acts like a bear! Then I suppose the next selfie will be from a hospital bed. I’m not anti-selfie. There’s joy and fun in capturing a moment in time when we are really happy or excited, or visiting somewhere we’ve never been before. There’s a loveable goofiness to snapping a selfie and then sharing it with others, a kid like declaration of “Hey! Look at me!” I get that. But when I look at all the most important photos in my life, the pictures I’ve saved and framed and display in my house and office, almost every one of them is with other people. There’s not many selfies in the bunch, very few solo shots. Instead there I am with family at my brother’s wedding twenty nine years ago, all of us smiling and happy, together. There I am embraced by my father on one side and my grandfather on the other, three generations standing tall on a summer day long ago. A snapshot of me baptizing a little baby girl, pouring water over her forehead, as I cradle her in my arms, the blues skies of an October Nantucket day as a backdrop. There I am with my six year old Goddaughter in a booth at a pancake restaurant, our special breakfast together, her smile a mile wide, ringed by chocolate. I do have a few selfies I guess I could matte and frame and then hang on the wall. There’s the stiff formal portrait I had taken for the church photo directory. But no. It’ll stay in the drawer, for the picture makes me look like Mr. Potato Head. There’s one of me on my bike in a recent charity ride, but that photo is missing my teammates, who gave me the courage to finish all 88 miles. If not for them I might not have kept riding. So…I think I’ll stick with group photos, when I am in a crowd, a community, a relationship. These remind me that in almost all of the times in life when I am happiest, at peace, connected to God, making a difference, giving love and feeling love: it’s not a “me” moment. It’s a “we” moment. Photographic memories teach me that with other people: this is how I find my true place in the world. I’ll leave the selfie taking to other folks. Especially the ones featuring a grizzly bear. Was Mayor Thomas Menino the last true public servant we’ll see in our lifetimes? I wonder about this, as Boston and Massachusetts mourn the man. I worry that Menino was the last of a dying breed, politicians who embrace the noble call of public service. Men and women who actually believe that when elected to serve the public, their job is to serve the public. Promote the common good. Protect the interests, not just of the moneyed, powerful or well connected but also the anonymous, the powerless, the every day folks who make up the heart of any community. Menino: Mayor of Boston for a record twenty years. He did so much. Shephered the renaissance of Boston as a world class city. Brought new jobs and businesses into the city. On watch when gang violence dropped to record lows. He wasn’t perfect. He ruled with fear at times: you didn’t want to get on his bad side. His record on the schools was mixed. He was called “Mayor Mumbles” for his less than soaring oratorical skills. But what I loved about the guy—and I was blessed to have met him and his wife—was that from the start of his mayoral career, he was in it for the work. For the job. To do something, anything, every day, to make his city a better place. He never saw being mayor as a stepping stone to some greater office. His administration was amazingly corruption free. By one estimate Menino personally met as mayor, more than half the residents of Boston. He lived in the same modest Hyde Park home for years, championed racial reconciliation and embraced the LGBT community long before it was popular to do so. And when things went wrong in his city he showed up. In Dorchester after a shooting. On the day of the Marathon bombings, checking himself out of the hospital. He was everywhere. He was mayor to be the mayor: from his first day in office to his last day at City Hall. What makes Menino’s departure from the world all the sadder is that public service as a vocation and calling is in crisis in our country. Who serves the public anymore? The overly obtrusive media makes many reluctant to serve. Cynicism among the electorate is at record highs. The ability of government to get anything done, at least in Washington, is in question. Office holders are afraid to take a stand for fear of being voted out. Perpetual re-election mode is the norm. Big money skews elections, democracy for sale. And when pols leave office, so many cash in unashamedly, with high priced jobs as lobbyists, consultants, corporate board members, think tank prognosticators, and media loud mouths: for hundreds of thousands, millions of dollars. 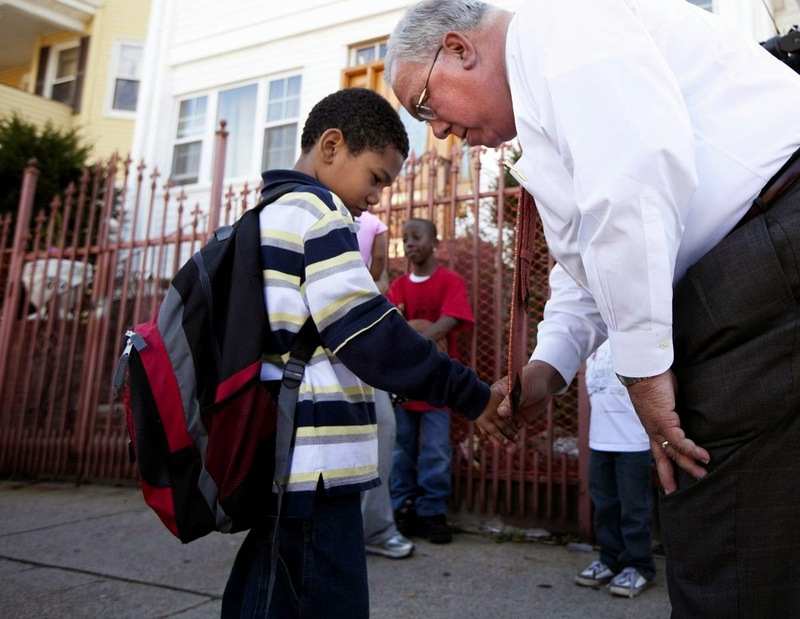 Let Menino’s legacy and death, then, remind us all that public service matters. That the best elected officials always see their job as a public trust. That the real public servants make a true difference in people’s live, in folks being heard and served: in everything from potholes repaired to a nation summoned to greatness. To serve the public is not supposed to be about ego or financial gain or power or celebrity. It’s not about hitting the jackpot with a TV reality show or some cushy gig upon retirement. Public service is about seeing what is wrong in our world and then trying one’s best to make it right. Public service is about entering into the rough and tumble world of politics and doing something, beyond issuing a press release, posing for a photo op or showing up an opponent. 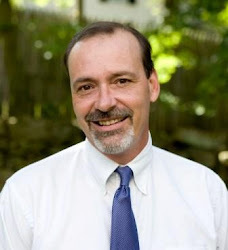 Doesn’t matter if you are a selectman, a mayor or the President. So God bless you, Mayor Menino. You did well, very well. We will miss you. Whether or not you were our mayor, you showed us that there is still a need for women and men to hear the call to public service. To roll up one’s sleeves, stand for election, and then work for the public, the greater good for all the people. Thank you for being a true public servant. Rest in peace.